Dylan is part of an all-star cast who have convened at the Shrine to celebrate Frank Sinatra’s eightieth birthday. While cameras roll and Sinatra is seated in A 18, DyIan unveils a remarkable version of” Restless Farewell,” all five verses sung with a nervy precision, accompanied by his usual musical misfits and a string quartet. The whole thing is actually rather moving, as is Sinatra’s seemingly genuine enthusiasm for the performance, which is subsequently broadcast on cable TV. ”All good you mr Frank’ And leaves mr Sinatra astonished hangng back in his seat. 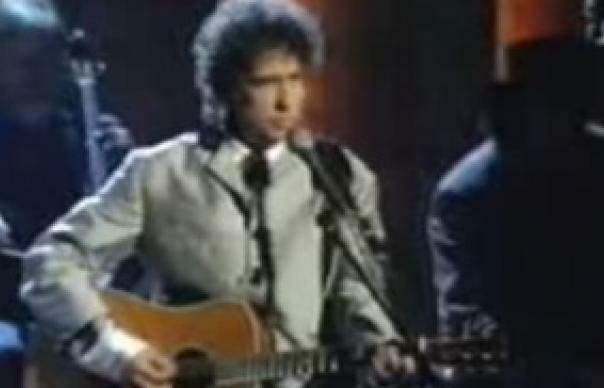 It’s only now obvisious why Dylan put so much effort in this performance. Far out!! one of bob’s best tv perfomances. for me, his best band – jj, tony, bucky and winston. after this and the Great Music Experience in Japan, bob should of gone on the road with an orchestra ! just great.